Well, I have all sorts of blogging to catch up on now. The next two will be about the Wyoming trip, then one about the NC RiverBassin.com Rodeo, and finally about a great local trip yesterday where I hooked a piglet of a river bass. But first, we got to talking the other day about where we have fished and where we want to someday fish. I realized I have fished rivers in the following states: PA, MA, NC, NY, VA, GA, CA, NM, CO, CA, WA, OR, TN, WY, ID, and Ontario, Canada. Not a bad count...and adding by the year! What's at the top of my list for river fishing? My top three states would probably be Alaska, Maine, and Florida (for Peacock bass). My top three countries are tought to pick, but would be probably include Argentina, Chile, and the Amazon basin in Brazil. I suspect there will be many other countries I get to before those though....too much of the world to see and enjoy! What are your top choices? I also wanted to say thanks to everyone who reads my blog. Over the past few months, I have had a lot of people tell me how much they enjoy reading. I have even had a few people recognize me around Durham....and it's kind of weird. I also get a lot of questions about the Coosa via YouTube, including a few that have said my videos and blog were the reason they bought one....super humbling. So again, thank you for everyone who takes the time to read this. I love to fish and share the amazing experiences I have, so please keep reading! Finally, I short reflection on Hurrican Irene. Floods always have me torn. I love studying water and seeing its immense power. I just flat out find it fascinating. But on the other hand I hate to see its devastation, especially when it puts people in danger. I know there was a lot of loss along the east coast and the clean-up and rebuilding process will take some time. I hope everyone out there made it through safely and suffered minimal loss. As summer winds down I hope many of you are out there enjoying the warm weather. It will be fall before we know it....and the big boys will be super aggressive again. Tomorrow - my WY trip. Tight lines! After weeks of frivolous work, I submitted a thesis draft and was off to Pennsylvania for a short visit with my parents as well as my sister, brother-in-law, and two nephews. Mary May and I had been stressed out for so long that we really needed the break. After her last final of the summer semester, we packed up and made the pilgrimage north to Woodward, stopping for dinner in Baltimore with a few of her good friends from college. Originally we were supposed to fish Sunday afternoon with my good friend Travis and then again on Monday with my father and brother-in-law. Travis knows the tributaries to the Susquehanna as well as anyone and has a few lights out techniques for big smallies. He and I grew up fishing together and lately we haven’t been able to spend much time with each other on the water. However, the weather was not cooperating. We got rain and thunderstorms nearly every day and the trip with Travis was cancelled. Mary May and I were both pretty bummed about that, but it did give us more time with family. The Monday trip was also a special one for me. Josh, my brother-in-law, is a hunter at heart, but is getting into fishing with my sister and nephews. He is also ex-Army and had his truck blown up by a road side bomb during his last stint in Iraq. Hailing from Wyoming, he really wanted to do some bass fishing and I really wanted to put him on some fish. My dad is an avid fisherman and has spent many a Saturday on the Susquehanna River in central PA. However, the river has gone through a few down years recently. It is slowly starting to bounce back, but can be tough fishing and tough wading at times. I also reached out to two friends in fishing to help get as much info as possible on where to take Josh. 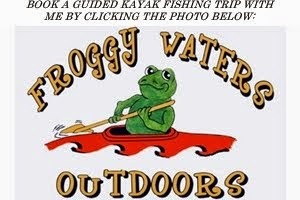 Thomas Boyd of ‘Fishing with Dad’ gave me a great contact for the lower Susquehanna River and Wilderness Systems pro-staffer Juan Veruete of ‘Central PA Kayak Fishing gave me some general info about wading the Juniata and Susquehanna Rivers. My dad and I went through a few plans before finally deciding on wading the Susquehanna below Sunbury. Tuesday afternoon we loaded up, bought a few baits, and hit the river. The water was a little high and stained due to the prior rains. I don’t love fishing the Susquehanna when it is stained, but we were determined to give it our best shot. Dad and Josh waded out below a rock ledge and Mary May and I fished a mixed flat above them. I gave Mary May all of the river fishing tips I could think of and set her up with a spinnerbait. I decided to start with a Lucky Craft SKT MR crankbait that has been amazing for me over the past two years. Fifteen minutes into the day my dad hooked into a big fish. It wasn’t jumping and we suspected it was not the acrobatic smallmouth. Indeed, after a great fight dad landed a brute of a catfish. About five minutes later Mary May was slow rolling her spinnerbait over a rock ledge when she turns to me and says “I think I am stuck again.” I could tell from the tone of her voice that she was unsure what had happened. I told her to shake the rod a little and suddenly drag started pulling. It stopped again quickly and we were both curious as to what was going on. I told her to lift the rod again. This time I saw her rod tip shake from side to side, a sign I have come to recognize over the years as the head shake of a big fish. We carefully waded over to the rock ledge and got Mary May set-up. I coached her on how to fight the fish as it ran through the chutes and eddies. We suspected it was another big cat as it bent her rod. Sure enough, the fish came to the surface and flashed its giant grey side. She fought the fish and fought him like a champ. Finally, the beast began to tire and we got him to an eddy. I got into the water and after some wrangling was able to control the fish. I lifted the channel cat from the water, unveiling a massive body. Mary May was all smiles – she had just landed her biggest fish ever. We estimated the fish to be about 28” and at least 10 lbs. After snapping a few pictures we sent him on his way, back to the depths of the river. She had caught him on a War Eagle spinnerbait with a chartreuse shad skirt – a bait I had picked out earlier that day and she had deemed a “lucky bait”…I guess she was right. The fishing was off and on the rest of the day. My dad landed a few short smallies before landing a chunk that looked to be as fat as he was long. I landed a 14”-15” smallie on a Berkley Gulp hellgrammite rigged on a shakey head to get the skunk off. I followed suit with a few short fish before switching to topwater shortly before we called it a day. The Lucky Craft Gunfish 95 did the trick. A huge fish blasted the bait as it came across a shallow rock pile, but he threw the hook almost instantly. A few casts later I saw a fish come up behind the bait…and simply smash it. He ran down river making acrobatic jumps. The 18+” fish came to hand and made my day a little sweeter. Unfortunately, Mary May and Josh weren’t able to hook up with any smallies during a very tough day of fishing. On Wednesday morning we were headed to the airport. The next leg of our trip was to Wyoming. Armed with two of my favorite fly rods, we weren’t sure what the next few days would have in store. It turns out they would be spent flinging flies in the shadows of the Bighorn Mountains. That is where I will start my next blog. Until then, tight lines. A gorgeous way to end the day with some great company!